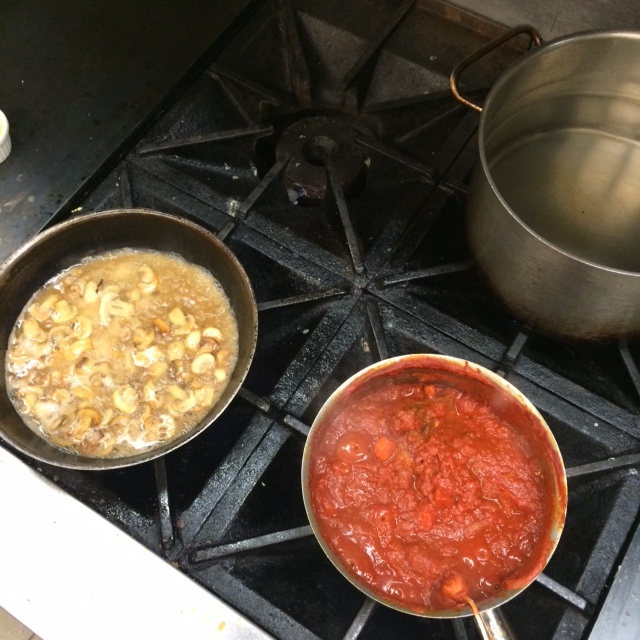 Working the stove, making tomato and chasseur sauce! Since starting the quarter 8 weeks ago, I’ve gained a much deeper respect for the art of (and labor that goes in to) cooking. One of our projects was to make demi glaze and it made me really appreciate what goes in to getting a product that adds such complex flavors. To make a demi glaze, you first have to make the stock, let it simmer for at least 8-12 hours, strain it, then reduce it again for another few hours. The end result is a totally rich, velvety, concentrated flavor that you can really taste when incorporated to a dish. We used our demi glaze to make a chasseur sauce, which I can’t imagine making any other way and achieving the same flavor. Sadly, because of the labor and amount of product involved, this will probably be the last time I make that sauce, but I will never forget what it tastes like! We also made a couple of soups this week. Everybody made cream of mushroom and I chose cream of broccoli over split pea for my second soup. I could easily eat either of those every single day. Although, the broccoli could use a little cheese if you ask me. These will definitely make it into the winter food rotation this season. I feel like a broken record and I know I’ve said this before, but I am in love with learning this stuff and in love with being in the kitchen. No matter how long my day was or how tired I am, once we get into the kitchen, nothing else matters and it’s all about the food and the process.